"The Wolfpack Is Coming",,,what a great diorama. You can almost hear the roar of the engines. How did you achieve the spinning prop effect? I was wondering how long it would be before you discovered the thread Carlos. Thanks for posting the pics.A really nice selection you have there. I think your also the only person I know that doesnt have problems with the infamous Academy decals! Hi Lampie. To simulate the spinning props, I took some clear mylar and cut them to the size of the kit props. I cut a mask from stiff cardboard and layed it on the disc and applied a thin coat of black and some yellow to the outer perimeter to simulate the tips of the prop blades. I drilled a hole in the center of the disc and chucked it in my drill. I then took fine steel wool and starting from the center I dragged it to the outer edges of the disc while it was spinning. I think the areas between the "blades" should be a little bit more clear, based on what I'm now seeing in photos. I cut off the kit prop blades and attached the hub to the disc as straight as I could. I hope this helps, thanks for the kind words, Wingman out. Very nice models of the Thunderbolts.Hey Nigel Hove about starting a Gallery for this nice builds? A gallery is something Im thinking about for the future, but for now I think posting photos here is a good way of keeping the SIG active initially. mwolfe, I just saw your two jugs. Holy crap they look great! Makes me want to try something with spinning props. [/quote]posting photos here is a good way of keeping the SIG active initially. The razorback build Is going forward. For the moment I’m checking the seams between the fuselage halves for gaps. Because I’ll going to paint it in Alclad I’ve need to be extra careful with the prepaintjob. For the moment I’m redoing those rivets that were lost in the sanding. Yes, I´ll going to update the tread about the build, but there’s been so little interest in the comments, so my though was that the guys don´t follow my build of this lovely kit. Hopefully next week I can send in a proper review on some decals for these big Jugs. 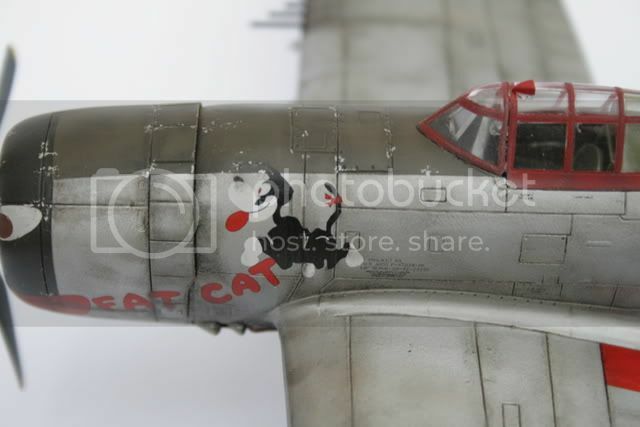 I just recently finished a P-47 razorback 1/48th scale from Hasegawa. I thought I might post some pics too and see what ya'll think. There are a few mistakes I made, please excuse,... it is only my second airplane project! I am starting to like building planes though! Had plenty problems (especially with teh Alclad paint) but in teh end I think it turned out alright! Hope tehy fit in this thread! This is Hasegawa's 1/48th bubble top. Currently, I'm experimenting with Alclad and here is the progress so far. Hi Matt. Thanks for the enthusiastic commment. My dad mentioned something about spinning props on one my builds. I think I'll use a thinner piece of mylar next time, and like I said before, I think the areas between the blades should be a little more clear. This thread is cool, it's nice to see these nice T-Bolt builds in one forum[Thanks Lampie]. Thanks for looking, Wingman out. First I just want to say how happy I am with how the SIG is developing and progressing. I havent been able to get online for a few days and I was really pleased to see the replies and photos since the last time I was online. A second 1:32 Jug also finished with the Talon nmf acrylics also made an appearance. Little more work while paint dries. I decided I wanted to have the cowl flaps open but I didn't want to order and wait for a resin part. This is what I came up with. Congratulations Gerald, surely some mistake though,,it looks like a definate 1st place to me!,Nice to see an ANG scheme too. Nice job on the cowling flaps HK,,youre a braver man than me,,lol. No mistake, the first place went to a fellow club members 1:48 Gee Bee which was flawless. Once I get my Hase 1:32 Jug done, that should hopefully earn a first place, but I'd be happy with just to be in the running at all. Whoa! Sweet thread. There are many great builds here. I really like all the T-bolts! 3) "The Home of the Jug" - a site with some interesting things about the jug. Hope these are of some use to someone. When I get round to it I'll post some pics of my other T-Bolts. 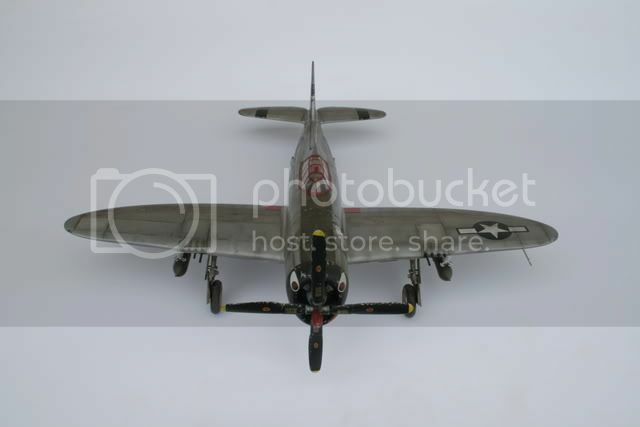 I know youve got at least one VERY nice P-47 on your shelves, care to share it with us? Congratulations Allen (Tomcat)..a very well deserved Highly Commended. Shame I couldnt make the show last weekend as I was working, I really missed not being there. Looking forward to your other photos. Carlos. Thanks for posting the pics.A really nice selection you have there. I think your also the only person I know that doesnt have problems with the infamous Academy decals! Thank you Nigel. For the Academy in 1/48 I used Aeromaster decals, the others in 1/72 are Academy. I found that with Microsol and patience they´re no so bad. 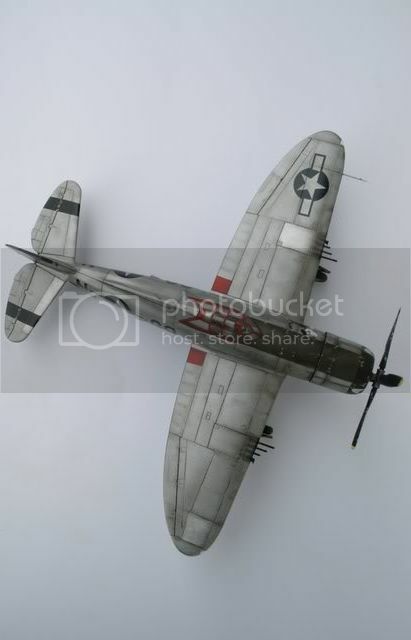 After building some Mossies (4) that I have waiting (a Bomber Mk IV 1/72 in the bench right now ready for painting - 109 Sqn Pathfinder) I´ll put my hands in another P 47D, a Razorbak Tamiya 1/48. Maybe in January. I saw your P 47 im the Rumble in the East Asian Sky thread and it looks great, congratulations !!! 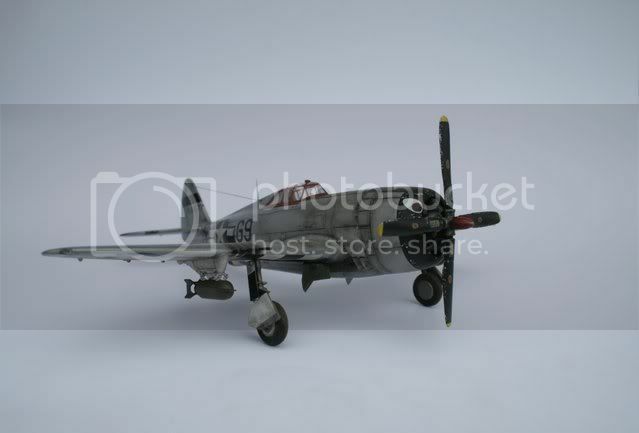 The P-47 N is probably the least represented of the Thunderbolt family,especially in 1:72. Hopefully we'll see an offering from TamiGawa in the not too distant future. I have the Italeri "N" in the stash but theres not much about it that tempts me to make a start. Has anyone built it? 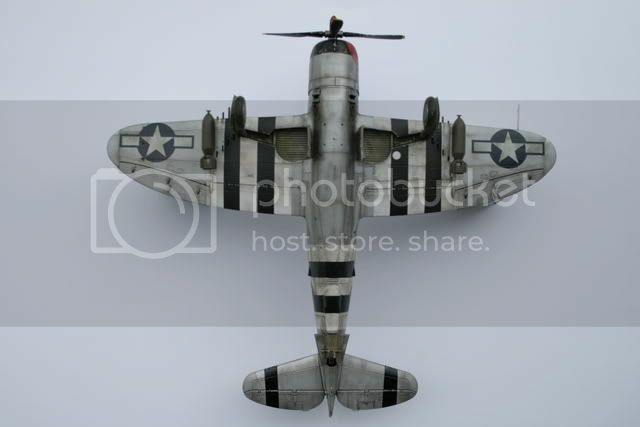 For 1:48 builders, this link was posted on Aeroscale in a different thread, but I just had to post a link in the SIG. I cant see the modellers name anywhere,( I believe he is Japanese), but the excellent article describes how he built an "N" using the Tamiya D Bubbletop as a base kit, with bits and pieces from other kits and AM parts. The riveting work is particularly impressive. Thanks for the compliment Nige. I'd be glad to. BTW, that P-47N link is great. That guy has got some talent for BMF. 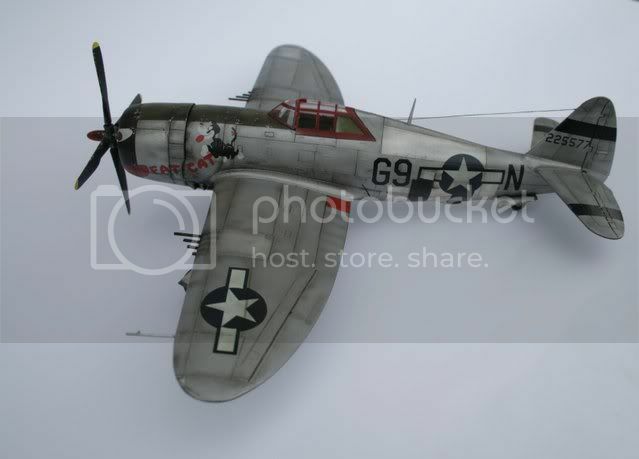 Anyway, here is a 1/48 academy P-47. A just for kicks 1/72 tamiya P-47 bubbletop in ASW scheme. My building is sporadic at best lately, but I hope to start an in progress thread in the next couple of days for the 1/48 tamiya razorback I have kind of been working on for quite some time now. Seeing this thread made me pull it out and I hope this plus a wip thread might be the motivation I need to get back to it. The George Rarey story is fascinating,funny, and ultimately very sad. Well worth reading up on if you havent heard of him. Great photos Chuck, thanks for posting them. Did you start the gallery especially for the SIG? Its something I was going to approach Rowan about but I guess youve beaten me to it LOL. Did you start the gallery especially for the SIG? A small update. Got most of the painting done and started working on small stuff. Added main gear detail, painted up small parts and gear doors. Here is a shot or two just to say "I'm still working on it." Some reference photos now and a story to go with them. In the Halesworth Airfield Museum resides a rather battered and corroded 75g Drop Tank. Pretty much in the condition you'd expect for a "find". A couple of weeks ago, a local farmer visited the museum. While discussing the various exhibits with one of the museums staff he announced," Ive got one of those drop tanks at the farm somewhere.If I can find it you can have it!" After 60 years in a farmers barn, its now in the museum. Probably the finest example of a drop tank Ive ever seen, and of course, all paint and stencils are original. Great reference photo opportunity.